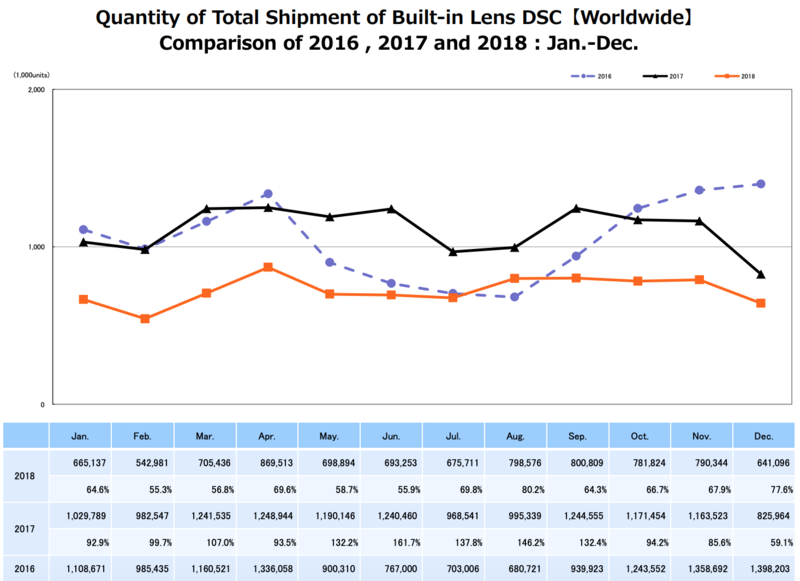 In 2018 total shipments decreased by 22.2% year on year in digital cameras with a significant decline in built-in lens digital cameras. In interchangeable lens digital cameras, having taken over the position of core product, failed to fill the gap. Total shipments (the cumulative total of shipments from January to December) of digital cameras in 2019 are projected to be 16.9 million units, a year-on-year decline of 12.9%. Of those, shipments to Japan and those to regions outside of Japan are projected to be 2.5 million units (a year-on-year decrease of 10.7%) and 14.4 million units (a year-on-year decline of 13.3%), respectively. Broken down by product type, shipments of built-in lens digital cameras are projected to be 6.9 million units (a year-on-year fall of 20.7%). Of those, shipments to Japan and those to regions outside of Japan are projected to be 1.5 million units (a year-on-year decrease of 16.7%) and 5.4million units (a year-on-year decline of 21.7%), respectively. Shipments of interchangeable lens digital cameras are projected to be 10.0 million units (a year-on-year fall of 7.4%). 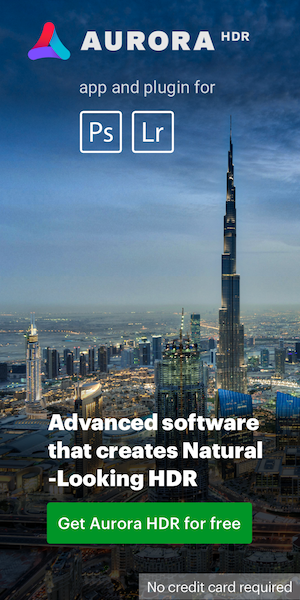 Of those, shipments to Japan and those to regions outside of Japan are projected to be 1.0 million units (a year-on-year fall of 9.1%) and 9.0 million units (a year-on-year decrease of 7.2%), respectively. 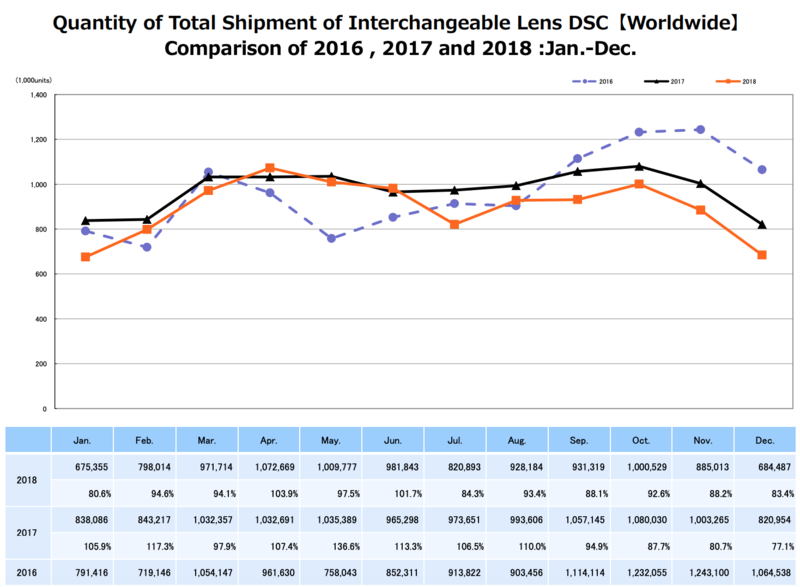 Shipments of interchangeable lenses are projected to fall 8.3% year on year to 16.5 million units. 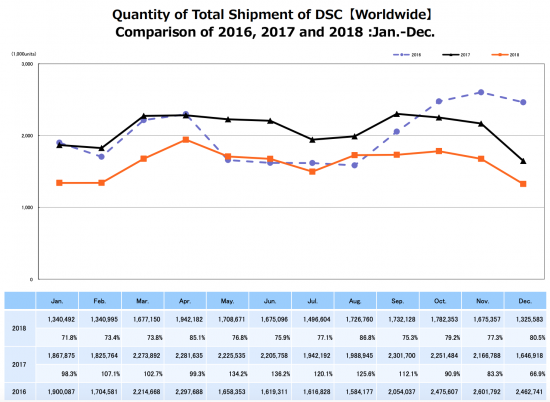 Of those, shipments to Japan and those to regions outside of Japan are projected to decline 14.3% year on year to 1.8 million units and 8.1% year on year to 14.7 million units, respectively. 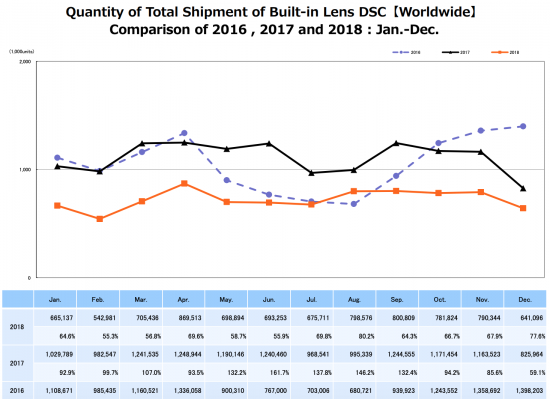 As in 2018, decreased shipments of built-in lens digital cameras will significantly weigh on total shipments of digital cameras. 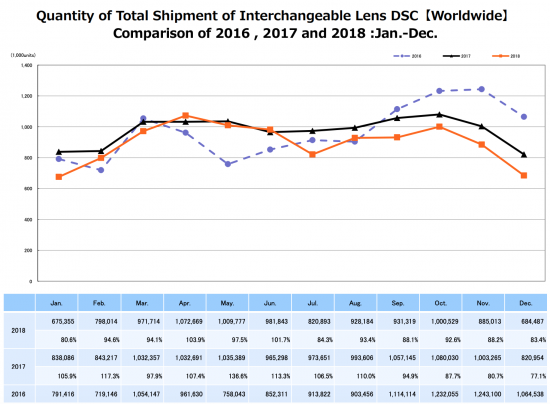 In contrast, shipments of interchangeable lens digital cameras will stay above 90% of the level a year before. So will shipments of interchangeable lenses. Against shipments of interchangeable lens digital cameras (bodies), those of interchangeable lenses, the other main actor, are projected to be larger by a factor of 1.6 to 1.7.